This recipe has been in development for more than three years. Our son Nicholas first suggested it as part of a dish he wanted to serve in his pretend restaurant, The Purple Tulip. It turned out very well that first time, but we had to make it several more times to be certain of the correct measurements and cooking technique . . . and we don’t eat tofu all that often, once or twice a month . . . and when we do eat tofu, there are several other recipes we like, especially Tangy Honey-Apricot Tofu . . . so it’s taken us a while to get in enough testing sessions to be confident of this recipe. with thinly sliced apple and red pepper, wrapped in a whole-grain tortilla. May also include lettuce and/or a thinly spread layer of beans sauteed with onions and mashed. 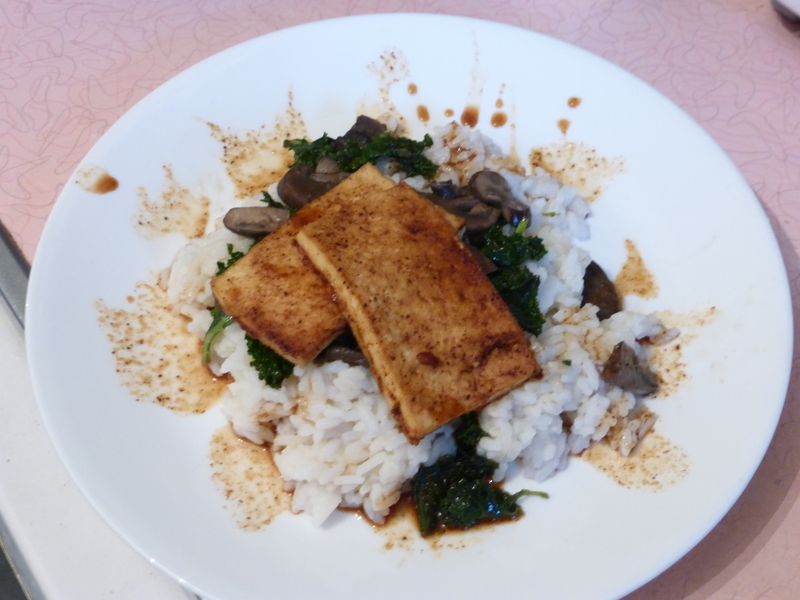 over rice, with kale and mushrooms sauteed in sesame oil, salt, and a little white pepper. This is the version shown above, elegantly plated for me by Nicholas. He prefers to eat his tofu separately from the vegetables, but he actually does eat those vegetables in decent quantity when they are prepared this way and served with Baked Tofu. Baking pan(s) providing at least 100 square inches of baking surface. A cookie sheet with sides is okay. If your pan is metal, you may want to line it with parchment paper because this sauce gets very sticky and can be hard to scrub off. Drain tofu. Place it on one of the towels, fold the towel around it, and press on it. You might even place a heavy object on top of it to apply pressure while you are making the sauce. The idea is to remove as much water as possible. Grease pan with sesame oil. Preheat oven to 375F. Whisk together all the other ingredients, in the mixing bowl. Unwrap tofu and slice it no more than 1/4 inch thick. Place slices on the dry towel. Dip each slice in the sauce to coat both sides. Place in a single layer on the greased pan. You don’t have to leave a lot of space between them, but it’s best if they’re not touching. Spoon just a little extra sauce onto the top center of each slice–just enough to make it thoroughly damp, not soaking in sauce. Set aside the remaining sauce in the bowl. 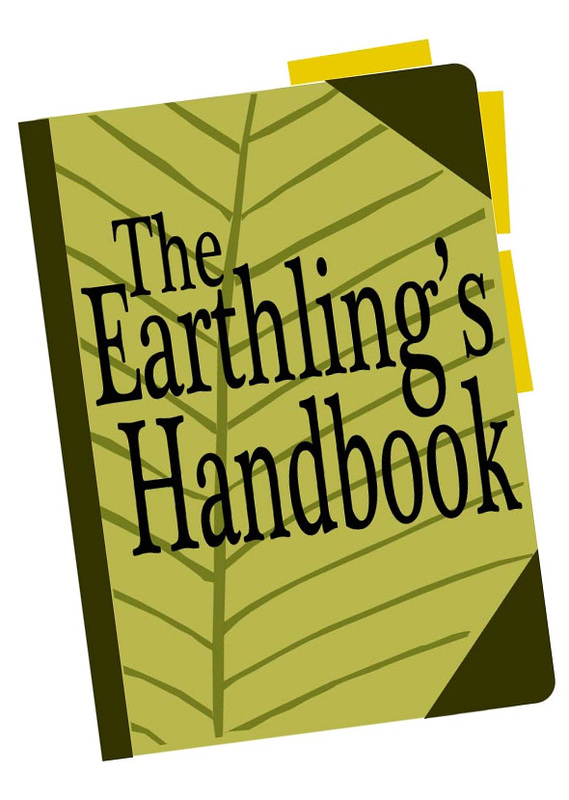 Visit Real Food Friday and Meatless Monday and the Hearth & Soul Blog Hop for more great recipes! Visit Works-for-Me Wednesday and Waste Not Want Not Wednesday for more great tips on various topics. I would use sherry here! Anything that combines wine as an ingredient has got to be the ace. Thanks for sharing this healthy tofu recipe at Real Food Fridays. Pinned & twitted. How cute is that… a pretend restaurant and even better that you embrace his ideas and make them real! I saw this at the works for me wednesday linky party and yumm! I love tofu and this looks delicious, thank you for sharing! I like the sound of The Purple Tulip – how lovely to have a pretend restaurant 🙂 Your Baked Tofu recipe has so many lovely flavours in it and I love how versatile it is. Thank you for sharing it with us at the Hearth and Soul hop. Oh, how cute – The Purple Tulip!